The summer of 2017 was a bittersweet season for me. In late July, I celebrated my graduation from the York College/CUNY Physician Assistant Studies program after two grueling years of coursework and clinical rotations. And after months of confinement in New York, I was free to enjoy three weeks off with my friends in Maine and family back home in North Carolina. The only problem was, as I discussed in my previous blog post, my face. A mysterious bacterial infection had developed in my beard area—as if to punish me for growing an actual beard for the first time in my life—and seemingly set up shop. 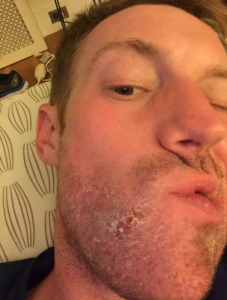 Despite a course of doxycycline and topical clindamycin lotion, the first-line treatments for impetigo and other superficial skin infections, my face went from bad to worse to full-on freak-out. It should come as no surprise, in retrospect, that the bacteria that had colonized my face had a mind of their own. Bacteria were among the first life forms on Earth, so it stands to reason they know a thing or two about survival. I didn’t know the specific bacterial culprit at this point and, after no improvement with both oral and topical antibiotics, I wasn’t even sure the problem was bacterial in origin. I could only watch in dread as my face morphed from day to day in a feeble attempt to mount a response to this new invader. It was at this point, in mid-August, that the follicular nature of my skin condition became more evident. Whereas before, in late July, it seemed to be a broad, generalized infection of the superficial skin (classically seen in impetigo), it now appeared to be originating in the hair follicles themselves. I still had significant swelling in both cheeks, but I was now developing painful cystic lesions, usually a pustule (by definition, a pus-filled vesicle) with a centrally placed hair. Though I didn’t know it at the time, this presentation is classic for folliculitis, which is broadly any inflammatory reaction of the hair follicle. All I knew was that these beard hairs hurt like tiny, excruciating needles. The only relief I could get was from pulling the offending hair out with a pair of tweezers. Usually the bulb of the hair would be covered with a greasy coating, and from the now empty pore a substantial amount of oily, yellow fluid would inevitably ooze. Unlike traditional “pimples,” there usually was only a minimal amount of pus and very little blood. Of course, self-manipulation and “picking” (which I hope to address in future blogs) only served to prolong and worsen my condition. I also attempted to shave a few times in these early months, reasoning that topical antibiotics would be ineffective if I continued to grow a beard. This also was a mistake, most likely redistributing the bacteria to previously unaffected follicles—like a bee pollinating flowers. While I don’t believe my skin condition was self-inflicted in origin, I now acknowledge that I fell into a vicious “pull-and-pop” cycle. In seeking temporary relief from the painful cystic lesions, I unwittingly delayed long-term control. Without fully realizing it, I was now in the grips of both a dermatological and psychological condition. 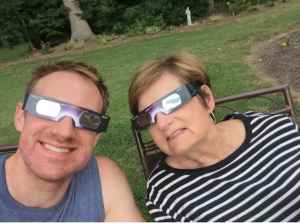 August 21, 2017: Gazing at the eclipse. Looking like a chipmunk. Any time away from New York City, as I’ve come to realize in my fourteen years here, is a welcome opportunity for renewal, especially when that time is with family and friends. But coming back to New York in late August 2017, I was more than a little uneasy about my face. Plan A clearly hadn’t worked, so it was time to move on to Plan B. I was placed on a different antibiotic, Bactrim (trimethoprim-sulfamethoxazole) and prescribed an ointment containing benzoic acid. Bacterial and fungal cultures were also obtained. The working theory was that this was indeed a bacterial infection, and that both oral and topical antibiotics would provide broad Gram-positive and Gram-negative coverage. It was during this time that things really went downhill rapidly for me. Cystic lesions got larger and inflammation swept across the full expanse of my beard. As with the previous course of doxycycline, I had no appreciable response to Bactrim. And the benzoic acid ointment did little more than coat my face in a greasy film. At one point I developed a cyst the size of a golf ball on my right cheek. Within a matter of days, individual beard hairs began falling out on their own, creating a patchy network of hairlessness and inflammation. Though committed to finishing the second course of antibiotics, I resigned myself to the grim reality that, whatever this infection was, it had gone too far. 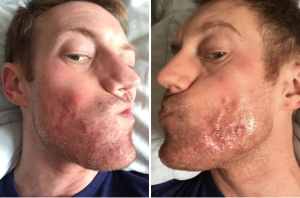 In my PA program at York College, one of my favorite professors, Dr. Edward Rampersaud, had frequently reminded us that in all bodily processes, “Inflammation leads to scarring.” No matter what, I was going to be left with permanent scars, front and center on my face. In future posts, I will come back to the psychological effects of acne and other scarring conditions. Suffice it to say for now, in the late summer of 2017, my face became a preoccupying concern. It became a topic of conversation with almost everyone I knew, particularly my mother, who would text me every morning, “How’s your face?” Usually the response was something along the spectrum of “Not great” to “God awful,” depending on the day. In early September, my bacterial culture finally came back, and the microscopic organism at the literal root of my problem was isolated: Enterobacter aerogenes, a Gram-negative bacterium associated with nosocomial—or hospital-acquired—infections. Around the time that everything had started back in July, I had been grinding out one of my last clinical rotations, in Internal Medicine. To put it mildly, there were a lot of very sick patients with very serious problems: C-dif colitis, decubitus ulcers, pneumonia, and sepsis, to name a few. Though I will never know the exact origin of my skin infection, the most plausible theory I have developed is that I: 1) touched a ventilator or other common hospital apparatus, then 2) touched my beard, where my bacterial friend Enterobacter set up a happy home, feeding off the oils in my follicles. The final diagnosis was now established: Gram-negative folliculitis. After two months of suffering and after failing two previous antibiotics, I was placed on a different antibiotic, ciprofloxacin (“cipro”), which has greater efficacy against Gram-negative bacteria. Within days of a two-week course, a miracle happened: I begin to clear. Swelling improved dramatically, and the follicular cysts that had been so painful and pronounced began to dissipate. Looking back on photos from this time, I was so clearly happy. 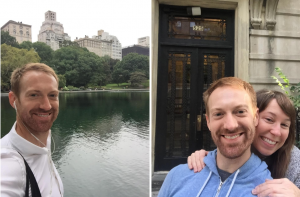 I was moving to a new apartment in Park Slope and preparing for the “PANCE,” or Physician Assistant National Certification Exam. The bacteria had been isolated, the appropriate antibiotic had been selected, and this nightmare folliculitis was behind me. But the nightmare was not over, as it would turn out. The course of cipro had afforded me a month-long reprieve, but the Enterobacter was simply too tenacious. In late October, I repeated a course of cipro—my fourth course of oral antibiotics over all—and again had about a week or so of relatively clear skin. By early November, the folliculitis was coming back at an alarming pace. My cheeks looked unhealthily inflamed, and the all-too-familiar cysts reappeared. My smile was gone and replaced with a look of disappointment and anxiety. This Enterobacter was a multi-drug-resistant survivor and, I had to concede, it had won the antibiotic battle. I simply could not go on another round of oral antibiotics. What good would it do? More than once I fantasized about getting admitted to the hospital. I would calmly study for the boards, catch up on The View, and slurp down Jell-O while more potent IV antibiotics coursed through my veins, drowning these demonic bacteria in liquid poison. Given my luck, however, I would probably pick up a different nosocomial infection and kill off whatever natural gut flora I had left. No Whoopi and Joy marathon for me. But this was war, and I was anything but resigned. Plans A, B, and now C had failed. It was time to unveil Plan D: Accutane. I realize it has taken two full blog posts about “my Accutane story” to get to the part where I actually started this medication. 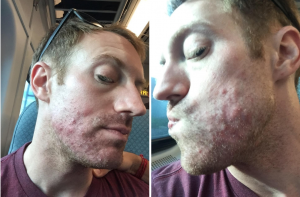 But for anyone who is reading this blog and dealing with severe acne or folliculitis, I wanted to share my own “pre-Accutane” story and images to chronicle my journey from beginning to end. 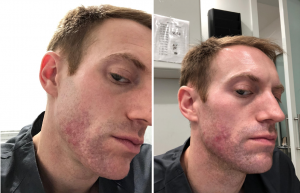 On November 13, I popped my first 40 mg capsule of Accutane and hoped that this medication—what felt like my last resort—would clear me, once and for all. 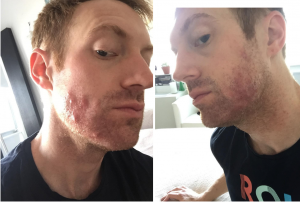 In Part 3, I will get to the heart of the matter: what is Accutane, and what does it do? How does it work in the treatment of acne and, in my case, folliculitis? What are the common side effects—some of which I have experienced myself—and what side effects are rare or unlikely? And, of course, I will discuss my own progress as I now enter my fifth month of treatment.